We hopped into a taxi boat Wednesday afternoon excited to leave the grungy heat of Belize City and looking forward to a few days of almost vacation. We don’t plan very many days ahead of ourselves and since the islands off the coast of Belize are transitioning into ‘high season’ we had a little difficulty booking a place to stay. We ended up getting a really great last minute deal on a hotel that was only a few more dollars a day than some hostels on Caye Caulker. After our 45 minute water taxi ride to the Island we found ourselves blinking in the sunlight walking down a rough dock towards unpaved roads and brightly painted buildings- the tense feeling the city had given us started to fade. After dropping off our bags to the hotel we immediately made our way to what is know as ‘the split’ on the North end of the inhabited portion of Caye Caulker. The split is a gap in between the northern mostly unsettled portion of the island and the southern end where most people live, work and visit. ‘The Split’ beach area is actually privately owned but there is a two story open air bar at the point selling ridiculously cheap beer and a dock for laying on and jumping off. I can see why Caye Caulker is still a backpacker and budget traveler’s paradise with a few non-budget travelers thrown in. Some of the tours are a little expensive but if you want to sleep, eat and drink cheaply you could enjoy the island for less than $50 USD a day and get a rockin’ sunburn in the process. We were lucky that we decided to go to ‘The Split’ in the last few hours of daylight we had Wednesday – that night the storm clouds rolled in and didn’t leave for the next 40 hours. Thursday it drizzled a lot but the crazy wind didn’t kick up till we were on our way back from our snorkel tour of Hol Chan Marine Reserve. 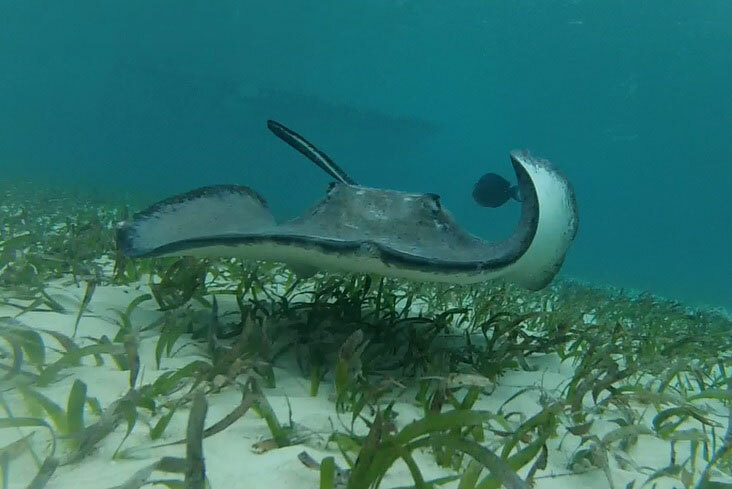 A portion of the tour allows you to snorkel with sting rays and nurse sharks which is pretty incredible. It is unfortunate to be surrounded by an equal number of tourists but being able to reach out and touch a sting ray or a nurse shark as they glide past you is amazing. I floated there watching the sharks nibble at the fish stuffed conchs our guides were using to attract them and I kept getting the image of all those Discovery Channel specials in my mind where a diver slightly twists the tail of the shark and it goes limp. Well – I really wanted to see if that would work. I picked out a smaller nurse shark perhaps 3-4 feet long and swam down to it. When I got close I reached out to grab it’s tail and very gently twisted. The shark rolled over in the water like a puppy looking for a belly rub and allowed me to bring it almost to the surface. I let it go and it swam away and went back to eating. The entire incident lasted less than 20 seconds but I would strongly discourage other people from doing this. The guide came over to me and warned me that although nurse sharks seem docile they can hurt you. Nathaniel got some great video of our trip to the marine park and we should be publishing the video tomorrow morning. After our day in the ocean we were pretty hungry and decided to splurge for dinner. While you can get some really legitimate meals for $5-6 on the island I really wanted to try the local lobster. Lobsters are generally laid out near restaurant front grills on Caye Caulker and you select your lobster based on how much you want to pay for it – the dinners also come with a variety of sides. A giant lobster with garlic toast, pasta and salad for $25 USD is just not possible in the US. Although the lobster was good I prefer eating at places the locals go when I travel. If you prefer the same I suggest grabbing some lunch at Pirates on Caye Caulker if you come. My $6 USD lunch consisted of Baked Chicken on rice and beans with a side of potato salad and a glass of limeade. If the same restaurant existed back home I’d still eat there. While the rain ruined a large part of our time on the Island (and cursed me with unappealing lighting) we’ve had fun walking it’s dirt roads, talking to people and exploring this tiny island. Belize would be a great starter country for many people people in the US nervous about traveling because it’s still incredibly affordable and the dominant language is English. TIPS: There are january flights under $500 available from San Francisco to Cancun right now. 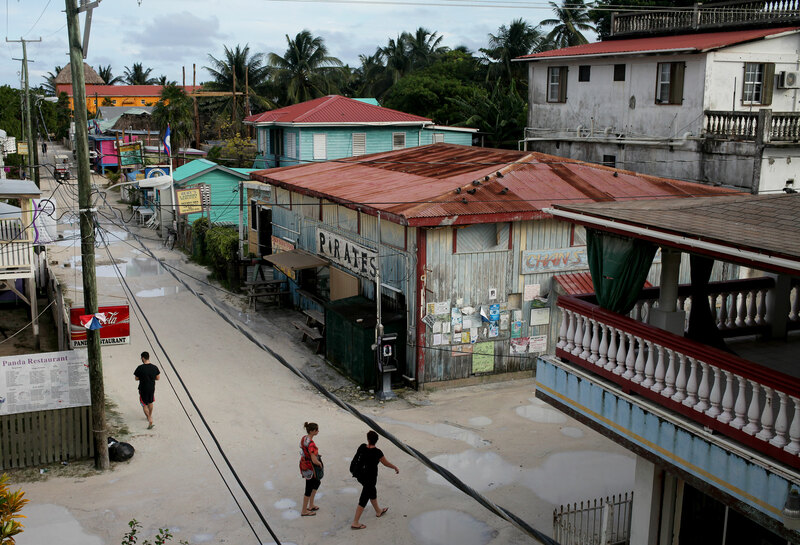 A $50 (isn) bus ride from Cancun can get you to Belize City within a few hours. Our Hotel was $56 USD a night although you can find cheaper if you book ahead. The elusive $5 Mexican lobster has alluded me before. Good on ya. Ray says, “Don’t end up like Steve Irwin.” Looks amazing though! Great pics! I have never heard of the island and will probably never visit but fun living it up through your adventure! Never say never. As Alex commented, you can get flights to Cancun for pretty cheap throughout the year and a hopper flight down to Belize can’t be much. Plus once you get here it is considerably cheaper than Hawaii. Just food for thought. P.S. I was thinking of Steve Irwin when we were out there.